Athletes will start on the south side beach of Lake Summerside. The swim will begin with a mass start from the beach. Athletes will swim south-west across the lake to go around the short-course buoy and back towards the beach. This loop is 500m. Athletes will then exit the water on the far south-east side of the lake to run on the sand, then grass, to enter transition. To begin the bike, athletes will mount their bike on Summerside Grand Blvd, heading east. Athletes will make a quick right turn to head south on to 88th street. Cyclists will stay right (as per the usual rules of the road), and will make a left turn to head east again onto Savaryn Drive. The direction of travel will change from east to south as Savaryn Dr. curves around a bend to head south. Athletes will continue on until they make a right hand turn at 25th avenue, heading west. Be aware that athletes must stay right as they travel on 25th avenue as the road splits with a meridian separating the direction of travels. 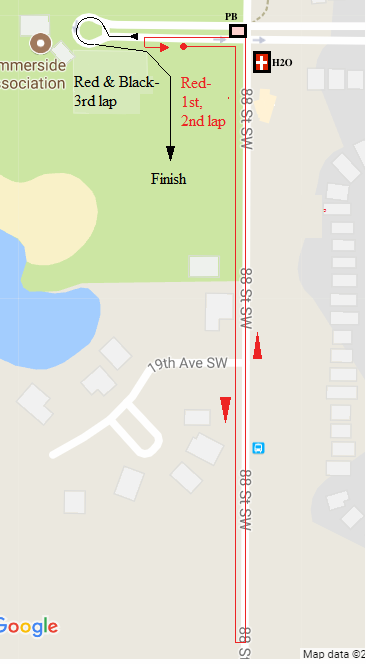 At the split in this meridian, at the intersection of Orchards Gate/90th street and 25th avenue, that athletes will turn around the meridian and head back east on 25th avenue all the way back past Savaryn drive and continue toward 66th st. Turning around 200m before 66th street, athletes head back and turn right at Savaryn drive. Athletes will continue back the way they came around the Savaryn drive bend until they turn right on to 88th street. Heading north on 88th street, athletes will continue just past Summerside Grand blvd where they will do a hairpin 180 degree turn on 88th street to head back south towards Summerside Grand blvd. turning left on summerside grand blvd to do a loop through transition, It is here that athletes will have completed one lap of the bike course – a total of 6.5km. © 2015 AIA Triathlon. All Rights Reserved.